There is no arguing the McLaren MP4-12C is a quick car. The numbers speak for themselves in that respect. 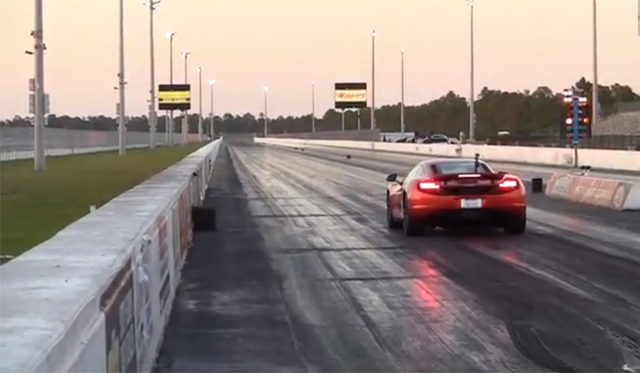 Although when a stock MP4-12C, on factory tires no less, runs a 10.55 second quarter mile at a ridiculous 134.56mph, the world should take notice. This crowns the 12C with the title of second fastest production car in a 1/4 mile. The McLaren is second only to the hyperbole inducing Bugatti Veyron, a car that costs fives times that of the 616 hp McLaren. Watching the video gives a good indication of what a fast car looks like versus a really fast car. The McLaren managed a 0-60mph time of just 2.9 seconds. A time that fast in any car is fast. But in a car that weighs 3,100 lbs with only 616hp? That is ludicrously fast. Check out the video above and prepare to be amazed.